Men, women, pregnant and lactating women, and children all have different iron needs. Find out how to tell if you have an iron deficiency and how best to raise your iron levels. Iron is one of the most common elements on earth. Every cell in our bodies contains iron. It is needed for vital functions of the human body including transporting oxygen to all of the cells in the body. We cannot survive without getting adequate iron into our bodies. Men, women, pregnant and lactating women, and children all have different iron needs. Women generally need more iron than men since we lose iron during menstruation and childbirth, where men do not. For this reason, women are more commonly found to be deficient. Other things can lead to the loss of too much iron including some gastrointestinal diseases — such as Crohn’s Disease and Celiacs Disease — that can cause excess bleeding in the colon. This excess bleeding causes iron deficiency in these people since they lose too much blood. Parasitic infections can also cause iron deficiency since the parasites living in the body use up most of the available nutrients including iron in the person’s diet. Alternatively, parasites can cause gastrointestinal bleeding that can lead to deficiency if they are living in the person’s colon. Restless legs or other muscle twitches. During pregnancy, a woman’s blood volume will increase by 50% as her baby grows and her placenta grows to supply her baby with nutrients. It can be easy for pregnant women to become deficient both because her blood volume has increased so rapidly and because her need for iron has increased to support both her and her baby. Women may also be lacking iron because of nausea and vomiting early in pregnancy can make it hard for women to eat the types of foods that contain iron. Pregnancy is a time where mothers should really be careful to get adequate iron in their diets. Inadequate iron can cause issues with fetal development as well as bleeding issues for the mother during childbirth and immediately post-partum. But what is the best way? There is some controversy about the best way to keep your iron levels adequate. But following the advice below is a good general guideline to keep your iron levels in check. Many doctors will prescribe pregnant women an iron supplement if they are found to be deficient, typically ferrous sulfate in pill form. But is that the best approach? No. Ferrous sulfate can cause nausea, vomiting, and constipation in pregnant women since it is so hard to absorb, which isn’t helping anything. Pregnant women don’t need to feel anymore nauseous than they already do, and constipation can lead to pelvic organ prolapse. Neither of those things sounds like any fun for a pregnant Mama! Some naturally minded Mamas might turn to using a “natural” product called Floradix as an alternative to the doctor prescribed ferrous sulfate pills. The problem here is that Floradix is still a synthetic form of iron and contains preservatives that aren’t good for us to be ingesting. It is also an isolated nutrient. 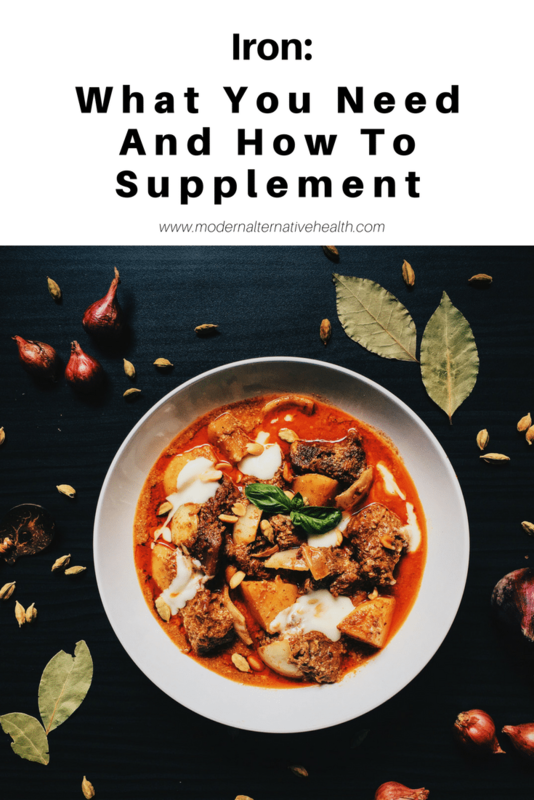 Consuming any nutrient in an isolated form can be problematic since the body needs many nutrients to work synergistically to be properly absorbed. Sticking with food sources of iron is the best approach. But there are things to consider, like whether or not your body absorbs Heme-Iron from animal sources best or if it absorbs Non-Heme from plant sources best. If your body responds better to animal sources then supplementing with desiccated liver pills will work to boost your iron levels. You can even make you own liver pills! If your body responds to plant sources better then consuming adequate dark leafy greens, wheat grass juice, barley grass juice powder and spinach will be beneficial. Herbs like yellow dock root and dandelion are great for boosting iron as well. This herbal iron formulation can help to keep your iron levels in check. Some people who are found to be iron deficient are actually struggling with other deficiencies, such as Vitamin B12 deficiency, folate, or magnesium deficiency. These nutrients work synergistically with iron for absorption. So if you are found to be iron deficient then it would be beneficial to have tests done to see whether another nutrient deficiency is complicating things. 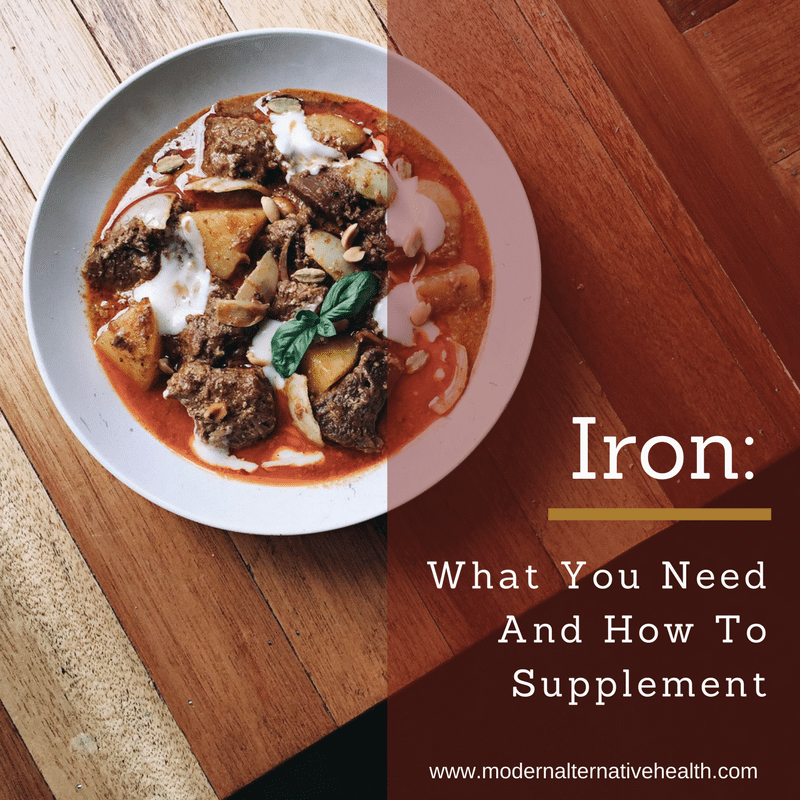 Sticking with food sources of iron is best since foods contain a wide variety of other nutrients that all work synergistically for proper absorption in the body. Make sure you eat your colors and include one large salad loaded with lots of vegetables every day. There are many yummy and healthy salad dressing recipes out there that can make a big salad feel very filling and satisfying. Have you struggled with iron deficiency? What do you do to make sure your iron levels are in tip-top shape?